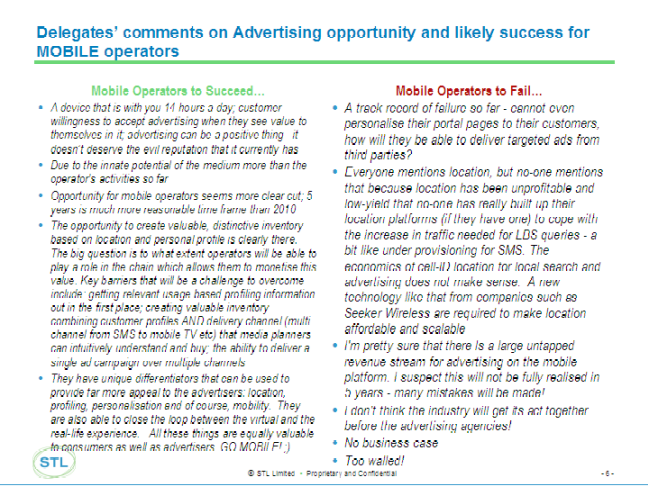 Below is our summary analysis from the ‘Telcos in Advertising’ invitation-only workshop at the Telco 2.0 event on 29th March, including key recommendations for the industry. This supported the findings in our Market Study (btw, if you’re a GSMA member or 3GSM exhibitor, you can get a healthy discount on the licence price). Sunil Gunderia, VP Head of Mobile EMEA at Walt Disney, picked up the baton and gave some insight into the content owners’ perspective. Disney is investing heavily in its on-line capability with content offerings covering Graphics and Apps, Games, Video and Audio. Advertising forms a core part of the business model by enabling free-to-user content and games and Sunil felt that the rise of ad-funded content would continue on-line. The paucity of good mobile content. Mobile data pricing inhibits the development and usage of mobile content, although Sunil noted that fixed-rate data plans will help drive traffic going forward. The propensity for walled gardens on mobile (in spite of what operators’ say) making the channel less attractive for consumers and content providers (3 and T-Mobile in the UK are exceptions here). The lack of a large-scale advertising infrastructure - lots of fragmentation makes delivery of advertising awkward and costly. Unclear consumer acceptance of mobile advertising. Nebulous business model for value chain participants - who does what and how are they rewarded? Sunil felt that mobile had some clear advantages for advertising - response channel and location-awareness in particular - but that much needed to be done if mobile content was going to develop. Without mobile content, the opportunity for mobile advertising remains limited. Stephen Stokols, VP Strategy at BT Retail, articulated the company’s vision for advertising. In fact, one suspects that he gave a clear insight into the overall strategy of BT Retail: open up and become an enabler. He pointed out that the enablers of internet growth (the fixed Telco’s) had pretty much been cut out of the growth and that advertising was a way for fixed (and presumably mobile ISPs) to carve out a valuable position from on-line activity. Leverage rich customer data. ISPs have clickstream, callstream, opt-in and demographic customer data and can leverage this (in an anonymous, aggregated way) to provide contextual and preference data to advertisers to improve targeting, interactivity and response. Turn dumb pipes into intelligent pipes. Telco’s have the opportunity to become the ad-serving network of choice because they have a complete view of customers (unlike portal players, search engines or e-commerce sites). They can serve relevant advertisements wherever customers go (on-line) and are not reliant on them visiting or transacting on specific sites. Enrich customer relationships. Telco’s have the opportunity to use this knowledge to deliver more relevant customer content and applications as well as advertising: they can be both the advertising enabler and the service provider. Stephen explained that currently BT is delivering this through on-demand TV (BT Vision) and a web shop for PC apps (BT Download Store). Soon the company will add BT Contact (an aggregation site for users’ communication needs - email, IM, etc from multiple providers will be unified on a BT portal). Scale - Google Has It…Can Telcos Develop It? Mads Moller, Vertical Head of Technology at Google and Arie Baak, Senior Consultant at LogicaCMG both explored the challenges for operators in carving out a successful niche in advertising. Mads outlined the changes taking place on-line (with media and audience fragmentation) and the power Google has in being able to organise the long-tail for users. On-line content and brands are growing at a startling rate and Google has been successful by helping users simplify this complex world. This has resulted in massive scale - Google delivers 81% of search page views in the EU and Google sites reach 150 million internet users in Europe. The clear implication for Telco’s was that partnering with Google was the way forward on-line and on the mobile. There remained a degree of scepticism to this in the room from operators! 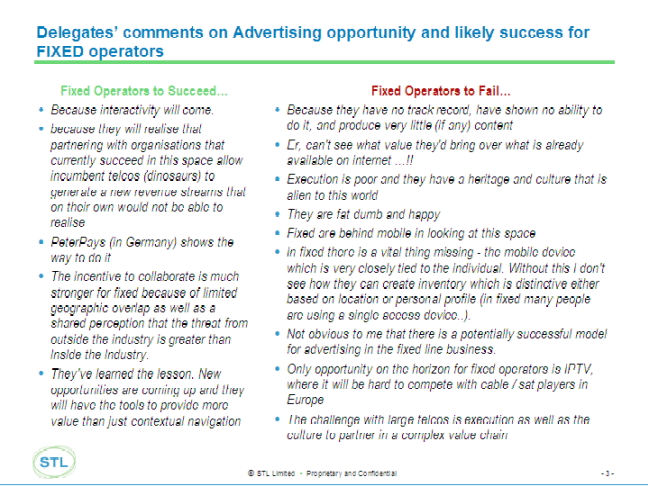 Arie picked up on a theme I had raised in my opening presentation: that the advertising market is far smaller than the mobile industry and that mobile advertising would need to reach $92 billion by 2011 (not the $11 billion currently forecast) to reach 10% of operators’ revenues. Later, Richard Saggers (Head of Mobile Advertising, Vodafone Group) said that some of the confusion about advertising becoming 10% of operators’ revenues may have come from Vodafone and that the company actually aimed to make mobile 10% of advertising revenues. Arie felt that mobile internet would not be sufficient to make mobile advertising a sustainable business and that only ‘in-service’ advertising could do this - i.e. advertising that is delivered in conjunction with core voice and messaging services such as SMS, MMS, Voicemail. He felt that delivering personalised advertising (based on individual customer criteria) was the solution but pointed out that even with this form of advertising (with its higher CPMs) the required number of ads (1.5 ads a day per subscriber across an operator’s entire customer base) meant that operators had to use all their available inventory AND get all the processes working perfectly. After lunch it was the turn of the operators themselves to talk about (a) what they are doing in this space and (b) company/industry strategies for success. We were lucky to have: Heinrich Arnold, VP Innovation, Deutsche Telekom; Hugh Griffiths, Strategic Advisor Group Strategy, O2; and Richard Saggers, Head of Mobile Advertising, Vodafone Group present. He forcefully made the point that mobile advertising is different to on-line advertising and not a simple extension of the tried-and-tested internet formula. Some of the differences we don’t even know about yet because our learning is still in its infancy but obvious benefits of mobile include: the response channel and ability to transact (which may become a much bigger area of advertising than brand); personalisation; ability to integrate with other media campaigns to manage the customer through the full purchase process (awareness-engagement-interest-action) - see bullet below on Contextual Information for more detail. 50% of brands say they will spend 5-25% of their ad spend on mobile in 5 years time. 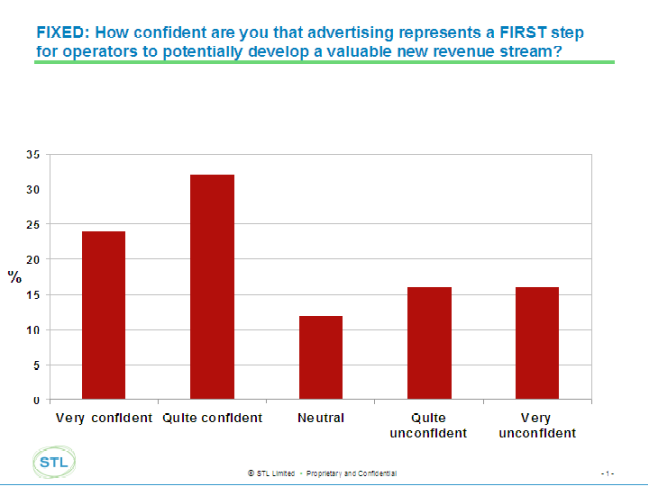 A large proportion of mobile customers say ad-subsidised content is attractive to them. 2006 - Tests and trials (such as Vodafone Italy Free SMS and MMS with ads; Vodacom (South Africa) Free ad-funded SMS to encourage people to call back ‘Please Call Me’). But a key point he made was that advertisers are trialling the mobile channel at the moment just as much as operators are trialling advertising. Only if they see value in it they will increase their budgets for the mobile channel. “The mobile industry has no right to expect growth in this area, it must earn it”. Contextual information. Heinrich explained the opportunity to integrate mobile with other media campaigns through barcodes. For example barcodes could be read by the mobile from products (e.g. Shampoo) or other advertising media (e.g. Newspapers and magazines) and then redeemed against products and services (e.g. Hair conditioner or digital music downloads). He pointed out the viral opportunities of having such barcodes disseminated by, for example, SMS amongst users. Heinrich explained the interactive advertising opportunities with the service where local users requesting a product or service (e.g. cinema tickets) are pushed SMS vouchers (e.g. for free popcorn at a cinema) and can purchase tickets and redeem vouchers through Qiro. Metrics/Measurement. These are a critical differentiator for mobile (and on-line) advertising and go hand-in-hand with the ability to use the mobile as a tool for responding to advertising. Broaden the Ad Platform. Operators underestimate the value they can offer in this area (and the threat the represent to the internet search engines) owing to the breadth of their assets. They need to develop a ‘platform’ that encompasses ALL their assets if they are to take full advantage of the advertising opportunity. Technical. For mobile, need sufficient bandwidth (and guaranteed connectivity) to deliver content and advertising and, for fixed and mobile, effective (federated) identity management capability to orchestrate the sharing of customer data (profiles, entitlements and analytics). Usability. The end-user experience remains paramount. For mobile, content (including advertising-related content) needs to be ‘made-for-mobile’ (with a 3-clicks-to-find rule) and, for fixed and mobile, demonstrably safe and private for end-users. Industry Collaboration. A go-it-alone strategy is doomed to fail. The industry needs to work together to grow the advertising cake. This does not preclude strong competition and individual company activity but this must complement the wider issue of building something of value to the new customer - the advertisers. Innovation. 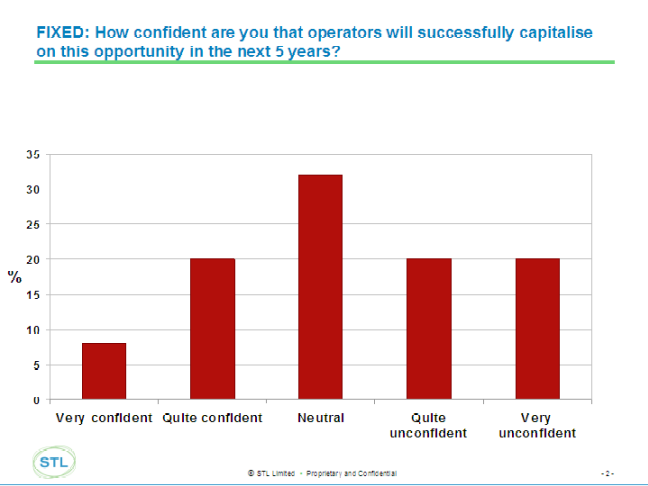 Operators are (often unfairly) criticised for their inability to innovate. The advertising opportunity will be a test of their capabilities in this area since it will require delivery of new services to new customers with new business models. Now is the time for operators to develop robust processes to manage the innovation process for advertising and other new business opportunities. Advertising is another way for operators become more of a trusted service provider to end users by providing highly targeted, relevant marketing which offers real end-user value in terms of high-quality content and services at cost and retail promotions. The advertising and marketing services opportunity creates a new upstream market for operators: providing analytics to brands and merchants not just ad-serving capabilities to end-user customers. Rigorous analysis of real addressable market(s), cutting across not only mobile, but also cable, ISP and TV (if a converged operator). Develop a ‘flexible strategy’ (based on a start-up mentality) that enables changes of direction as opportunity becomes clearer supported by a ‘best-efforts’ business case. Create a dedicated and flexible organisation which operates outside the structured processes and culture of the core business. Continue partnerships and trials to develop understanding of customer experience and operator/partner roles and business models. More creative customer segmentation - micro-segmentation to establish framework for targeting and personalisation of content and advertising. Define rules for automating the CRM processes and systems required to support a data-driven advertising platform. Analyse in much more depth the commercial and technical interfaces between mobile/Telco content and advertising industries. Educate advertising industry by making things simple and demonstrable. More creativity in developing business models to grow the advertising and content opportunities. 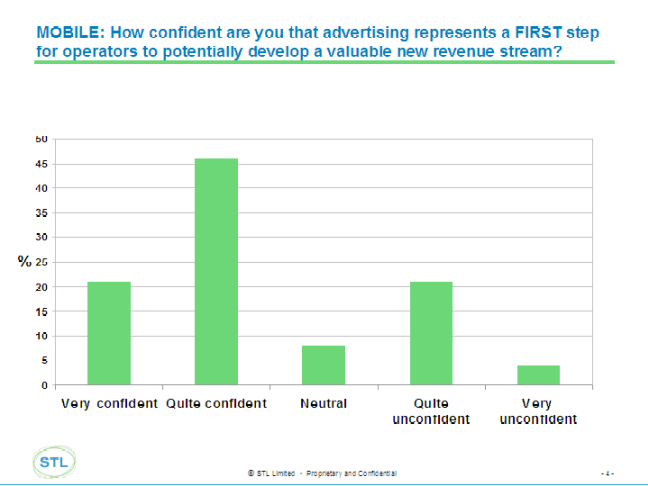 How confident are you that Operators can create a valuable new revenue stream from advertising in the next five years? 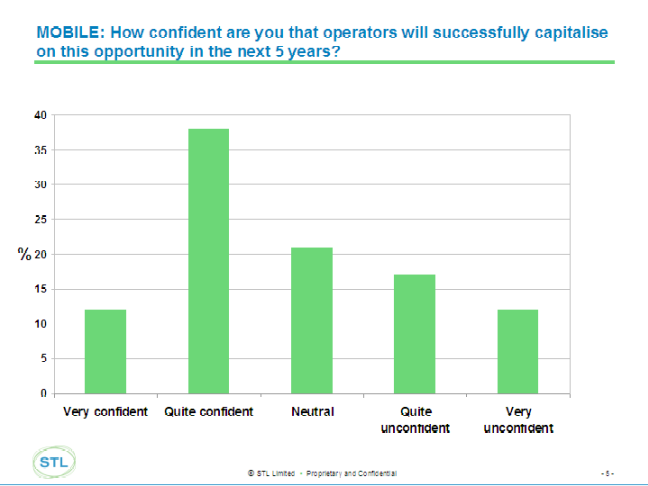 How confident are you that Operators will successfully capitalise on this opportunity in the next 5 years? The responses are shown in the graph below, and followed by their comments.